Stock #4108, Retail Price $29.95. To buy a copy now, click here. New Game Value: Three new empires come to Federation Commander. The Vudar, a Klingon "Subject Race", were allowed to build ships (with ionic weapons) to patrol remote regions. Then they rebelled. The ISC, considering the rest of the galaxy to be full of dangerous lunatics, stayed out of the General War. When it ended, they declared themselves to be peacekeepers, but were they really after conquest? The Andromedans, a minor nuisance for decades, launched a full-scale invasion of the galaxy just after the General War ended. Can the empires work together to survive, or will they fight in a burning house? This product requires Romulan Border or Klingon Border or Academy for use . ISC: 145-DN, 146-CA, 147-CL, 148-DD, 149-FF, D11-battleship. Vudar: 150-DN, 151-CA, 152 -CW, 153-DW, 154-FW. Andromedan: 155-Intruder, 156-Conquistador & Cobra, 157-Mamba, 158-Cobra, 159-Battlestation, 160-reference card. Squadron Boxes #28, #29, and #30 provide one each of the pewter scale miniatures to match the Ship Cards in this product. SKU 4328, 4329, 4330; Retail $34.95. Boosters #28, #29, and #30 provide additional copies of the most often used Ship Cards so you can fly multi-ship squadrons, and entirely new Ship Cards. SKU 4228, 4229, 4230; $9.95. Border Box #10 provides 24 miniatures to match the ships in Boosters #28, #29, and #30. SKU 4410; retail $99.95. To buy any of these products now, click here. 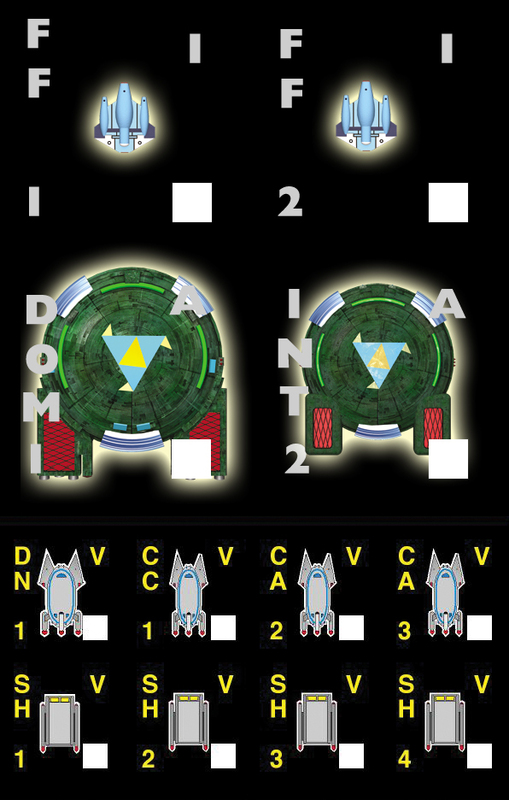 Due to their large size and their high cost the minis of the Andromedan Dominator and the ISC Battleship will be sold seperately from the Squadron Boxes and Border Box 10. The combination of the rules in this product, and the rules fromRomulan Border or Klingon Border or Academy provides all the rules required to play the ships in this product. One of those three products is required to play .